A few years ago I decided that I really wanted a fancy new camera so I could properly indulge my budding interest in photography. Problem was, I didn’t have the cash. But what I did have was a closet literally full of old games I hadn’t played in years and would probably never play again. I think you can guess where this is going. At first, I was extremely disappointed in eBay auctions I set up. When I set minimum reserve 1 the games didn’t sell and when I didn’t set reserves I got what I considered paltry sums. Why wasn’t anyone willing to pay what this stuff was worth to me? The fools! Many a person trading used games to places like GameStop probably ask the same question: how come it never seems like they offer a fair price? Some of the games I was so attached to that no reasonable price could make me part with them. You can't have them! The reason, I eventually remembered, has to do with what’s called “the endowment effect.” Basically this bias in puny human thinking leads us to over value something literally the second we consider it to be ours. Richard Thaler elegantly illustrated this phenomenon in an experiment involving coffee cups. One group of Thaler’s subjects was shown coffee cups and asked, “Hey, what would you pay for one of these babies?” A second group was actually given the coffee cups and then asked “Hey, how much would it take for me to buy that coffee cup off you?” The average dollar values from each group were WAY different, with the folks who had been given cups saying that their cups were worth a lot more. In other words, they demanded more to relinquish the cups than they would have been willing to spend on procuring them in the first place. Totally irrational. Behavioral Economist Dan Ariely provides a more elaborate but cooler demonstration of the endowment effect through an experiment involving students and highly coveted tickets to Duke University basketball games. When Duke’s fervor over its basketball team outstrips the supply of tickets, they are often given out according to a random lottery. One season Ariely contacted those who had won the right to tickets from the lottery and asked how much to buy them. Similarly, he contacted those students who had lost the lottery and asked them how much they’d be willing to pay for tickets if he could find a seller. Those who had won the lottery demanded an amazing average price of $1,400, while those who did not have tickets offered to pay only an average of $170 to get them. Woah. Endowment effect indeed. Which group do you think is playing the part of GameStop in this example? Done? Okay. There’s more to this phenomenon, though, because other research has shown that the endowment effect is rooted in something deeper: that the object has significance. Let’s go back to my rapidly diminishing game collection. After realizing that I had to overcome the endowment effect, I started pricing things to move. There were, however, some games that I simply could not bring myself to reduce my prices on. 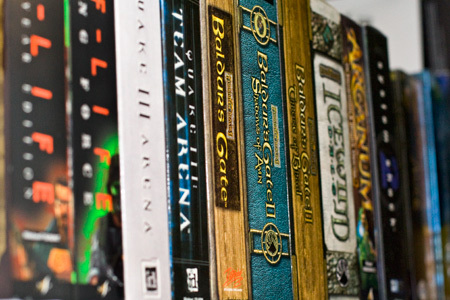 These were watershed games in my time with the hobby: Baldur’s Gate II, Half-Life, Quake III, NOLF, Planescape: Torment, and other stuff that I had a real history with. Why couldn’t I part with them the same way I’d parted with the others? I’d still probably never play them again. So next time you try to hawk some of your old games, you should first consider how the endowment effect is inflating your irrational expectations about how much they’re worth. Then try telling a story about your experiences with the game and why it’s important. Maybe you’ll win that glassy-eyed Assistant Manager over with you tale. To me, this becomes especially interesting when you apply the implications to in-game items. For example, Jade Empire frequently gave you new weapons (and thus new fighting styles) by having NPCs pass their weapon of choice on to you. Not only is this an excellent way to give them flavor, it makes them much more significant in the eyes of the player. Similarly, scattered throughout Far Cry 2’s game world are briefcases containing diamonds. These collectibles are frequently found in a context that implies some kind of backstory- a body or two, perhaps. It’s obvious that these snatches of narrative help make the act of discovery more rewarding to the player, but it’s interesting to consider how it ‘endows’ the diamonds with additional value as well. All this is just personal preference, of course- I’m always more concerned with game design than I am with the gaming industry. Thanks for serving up some more food for thought! I wonder why the Endowment Effect works differently when it comes to interpersonal relationships. There, it seems, we value things we don’t have at a much higher price than things we have. Tons of anecdotal evidence points in this direction, for me and my friends at least. I share those feelings as well, I would not give up my games, even though I could replay them from steam at a tiny fraction of the price and at any time I want. I suspect this bias is stronger when it comes to players selling their MMO avatars. Imagine the emotional effort in raising their avatar and the tears to part from it. Or perhaps the considerable emotional reactions when your savegame file has been overwritten or deleted. Oh the pain! I have to wonder if there are any links between the endowment effect and loss aversion? Richard Thaler’s name is spelled “Thaler” (important for people who want to look up the work). @Joseph – yes, loss aversion is an important basis of the endowment effect. Heh, I tried selling my WoW avatar, level 80 with an item that I would guess that less than 1/10th of one percent of the population has (an original Palomino fast mount) on craigslist for $1000. Never even got a single email of interest. Then I realized I didn’t want to sell it even for $1000 and that I would probably never sell it. Yeah, I wasn’t even really thinking of it in terms of virtual stuff like in-game items or even characters/accounts. But I bet the same effect shows up. Somebody should study that. Go on. I’m waiting. odd,this must be the first thing mentioned here that i have never experienced…i tend to act logically on this subjects so when i know i wont use an item i will sell it very easily(too easily maybe). I think the second experiment mentioned doesn’t prove much. The average buyer offers 170 dollars. But you don’t try to sell to the average buyer, you try to sell to the highest bidder. So it is no surprise at all that the price is that different. This site is fantastic. Keep posting! Well, that’s the thing about people –some do, some don’t. I’m not sure I’m following you. You mean the basketball tickets one? It proves that once people possessed the tickets they valued them a lot more than they did before they got them. Oh, you actually replied to my comment. Yes I meant the basketball ticket one. Ok, what I mean is this: what you demand for something is not a perfect representation of how much you value something. Surely you won’t demand less but often you demand more. If I were to ask a ticketholder for how much money he would, hypothetically, trade in the ticket I would get a lower number than when I’m actualy showing interest. Even more important: when the ticketholder knows or suspects that there are several potential buyers, he would exaggerate the price even more, because there’s got to be one who is willing to pay more than the average buyer. Ok so I’m a bit late here. But isn’t this just plain old greed? I myself am looking for a Macbook. But I’m refusing to pay more than 250€. However the standard price on a used MacBook is around 500-700€. Which I’m not paying. I don’t want it enough to pay that. Now let’s twist that around – I got a MacBook to sell. It’s fairly broken.you think I’ll sell for 250? No. Others sell at 500-700 so I’m not selling for less than 500. Same with all examples – Given any prior knowledge about an objects value, a buyer will offer low if asked. A seller will ask overprice if given the choice. It’s no special effect just plain old greed. Or did I miss some part here?